Facts about False Gharial. "Scientific name for False Gharial crocodilian is Tomistoma schlegelii". False Gharial is also called the false gavial or the Malayan gharial. The False Gharial crocodilian is a fresh water reptile which has an elongated, thin snout. 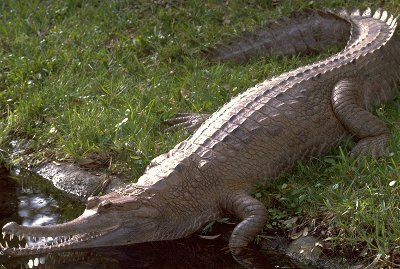 The False Gharial crocodilian is listed by the IUCN as a vulnerable species due to its population which is approximated to be below two thousand five hundred adult individuals. The False Gharial crocodilian can be found inhabiting Sarawak, Peninsular Malaysia, Borneo and Sumatra. However, the breed has become an extinct species in Thailand although it is not clear whether or not the species remained in Java. The False Gharial inhabits rivers, swamps and lakes. In the early 1990s, the False Gharial crocodilian breed was observed in ten different river drainages of thirty nine localities in Borneo. The species also occurs in fresh water a ecosystem which is found along the Barisan Mountains, east of Sumatra. However, the present distribution of the species has reduced by approximately thirty to forty percent. This has been caused by fires, agricultural activities, hunting and logging. The false gharial is a larger in size growing to lengths slightly smaller than that of the gharial crocodilian. The male species can develop to maximum lengths of about twelve to thirteen feet (3.6 to 3.9 meters) with weights of approximately one hundred and ninety (418 lbs)to two hundred and ten kilograms (462 lbs). The female False Gharial crocodilian is usually smaller than the male species growing to lengths of about eleven feet (3.35 meters) and measures ninety three kilograms in weight (205 lbs). Occasionally, the male species can develop up to sixteen feet in length (1.8 meters). The False Gharial crocodilian has a dark reddish-brown upper surface color with black spots or dark brown and cross-bands on the tail and back. The False Gharial crocodilian snout is slimmer compared to the slender-snouted crocodile and the gharial crocodilian species. The unornamented smooth snout is extensively long and parallel sided, slender with great lengths of about three to four times the width at the base. Its ventral has a grayish-white coloration with lateral dark mottling. The young ones have a mottled black coloration on the sides of body, tail and jaws. The False Gharial crocodilian has individually socketed, needle-like, long teeth which interlock on the insides of the jaws. Its dorsal scales are broad at the middle part of the body extending towards the sides with webbed digits at the base. The species single pair of scales which are located behind the head are slightly enlarged. It is important to note that, some of the False Gharial crocodilian species bear a number of adjoining small keeled scales. The distribution of scales on the False Gharial crocodilian species is divided medially by the granular soft skin. False Gharial crocodilian is a mound-nester. The female species usually lays small clutches of approximately thirteen to thirty five eggs in a single nest. The False Gharial crocodilian produces the largest eggs of all the living False Gharial crocodilians. The female species become sexually active and mature upon reaching lengths of about eight to nine feet. The length attained is usually large in comparison to the sexual maturity lengths attained by other False Gharial crocodilians. The crocodile species preys on larger vertebrates, which includes long-tailed macaques, proboscis monkeys, reptiles, water birds, and deer.